The northern pike is an elongated fish. A dorsal region that is bluish-green to gray in color distinguishes Northern pike from other members of the pike family (chain pickerel, redfin pickerel, and muskellunge). Their sides having irregular rows of yellow or gold bean-shaped spots. They also have fully scaled cheeks and five sensory pores on each side of the ventral surface of the lower jaw. The range of the northern pike is extensive, having a range greater than any other freshwater gamefish. Pike can be found throughout the northern half of North America. Pike prefer clear, shallow, vegetated areas of lakes and larger rivers. Spawning takes place soon after ice-out when temperatures reach 35 F in shallow waters. The female broadcasts the eggs over aquatic vegetation while two or more males fertilize them. A large female northern pike can produce 250,000 to 500,000 eggs. The adhesive eggs stick to the vegetation and hatch within six to 29 days depending on water temperature. The young pike typically attain a length of six inches by their first fall. Sexual maturity is typically reached in three years. The northern pike is a highly prized gamefish. It is a fantastic fish to catch just based on its sheer size, strength, and fighting ability. The meat of the northern pike is white, great in flavor, and has a flaky texture, however it is quite boney. Pike are captured using large spoons or minnow-type lures fished along the edges of weedbeds. Another popular method is using a large live golden shiner or sucker fished beneath a large bobber just after ice-out in shallow coves. 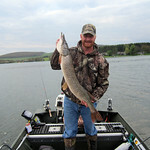 The Youghiogheny Reservoir's pike fishery is governed by Pennsylvania regulations.